The latest plan is for Kanal Istanbul to be 45.2 kilometers long through Istanbul's Avcılar, Küçükçekmece, Başakşehir, and Arnavutköy districts. The idea of creating an alternative to the Bosporus Strait, often bogged down by thousands of vessels, is no longer a dream and is quickly becoming a reality with the Kanal Istanbul project. A key among the government's 2023 goals, the idea was floated by President Recep Tayyip Erdoğan in 2011. Recently a 1/100,000-scale route and reserve structure plan for Kanal Istanbul was completed. 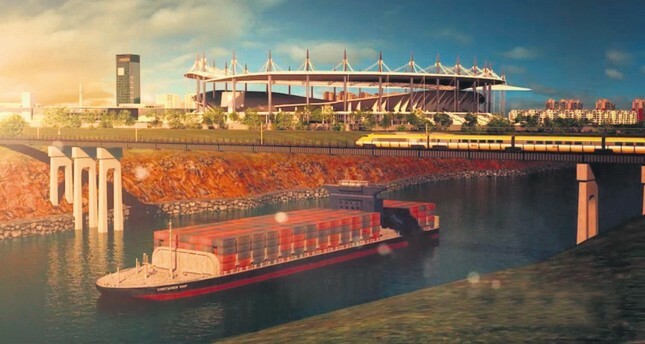 According to the latest plan, the canal will be 45.2 kilometers long through Istanbul's Avcılar, Küçükçekmece, Başakşehir, and Arnavutköy districts. Erdoğan is expected to announce the details of the project soon. A bidding process for the construction has also begun. Kanal Istanbul's route, selected from five options, has been finalized with the first drilling work already underway. The excavated earth from the project will be used to create three groups of islands in the Sea of Marmara. The first group and second group will be around 186 hectares and 155 hectares, respectively, while the third group will cover 104 hectares. The remaining soil will be used along the Black Sea coast and in the construction of a new coastal area near Lake Terkos. Under the 1936 Montreux Convention merchant ships can cross the Bosporus unhindered. At the time of signing the agreement, only 3,000 ships made the passing annually, but that number has reached 50,000 today and is estimated to reach 65,000 in 2030, and 100,000 in 2050. An additional 2,500 vessels, including city lines and fishing boats, also operate in the strait. Kanal Istanbul's route will start from the line that separates the Sea of Marmara from Küçükçekmece Lake. It will run toward Sazlıdere Dam Basin through the districts of Altınşehir and Şahintepe before reaching the Black Sea from the east of Lake Terkos near Terkos and Durusu. The project area will be within the boundaries of Arnavutköy (28.6 km) Küçükçekmece (7 km), Başakşehir (6.5 km) and Avcılar (3.1 km). The project costs an estimated TL 65 billion ($17.3 billion). The construction will employ more than 6,000 people and 1,500 people will be employed in the operation phase. Approximately 1.5 billion cubic meters of earth will be excavated and more than 115 million cubic meters of material will come from the sea and bottom screening. Container freight ports will be built both in the Sea of Marmara and in the Black Sea as part of the project. The port in the Black Sea will be 4.8 kilometers long. A logistics center will also be built. Istanbul Third Airport will be integrated with the project by rail lines. In addition, two marinas will be built on Başakşehir Lake and Sazlıdere with a capacity to host 200 and 860 yachts, respectively. Six bridges that will pass over Kanal Istanbul will provide land and rail transportation while six additional bridges will be built for the passage of wild animals. Apart from the bridges, there will also be emergency docks in the canal. Lighthouses and waiting areas in the Black Sea and the Sea of Marmara will be constructed. The construction of the route, on which the horizontal engineering work is already underway, is expected to be completed in five years. Once completed, even 350-DTW vessels will be able to pass. The project's economic life will be 100 years. Meanwhile, the Environment and Urban Planning Ministry has finalized Kanal Istanbul's environmental impact assessment report, which included plans for green areas, urban planning and areas of protection. Areas of protection, social infrastructure, disaster hazard areas, water, wastewater and waste systems, health, tourism, transportation, highways, railways, maritime and airways were also assessed. Twelve kilometers of the route pass through Sazlıdere and 8 kilometers run through Küçükçekmece Lake. One kilometer is forestland. The remaining 23 square kilometers will be acquired by the government. Şahintepesi, a neighborhood with more than 35,000 people will be most affected by the project.